Last night we bought an 8 pack of sandwich buns since we needed rolls for our yummy salmon burgers. We knew that we’d have lots of rolls left over so we planned another sandwich-centric meal for tonight with some of my favorite grilled ingredients: sausage, peppers, and onions! It was still 70 degrees at dinnertime so we built a fire in our fire pit and spent the evening sitting out on the patio. Place the red pepper and yellow onion on a bowl together and drizzle with olive oil. Toss to coat. 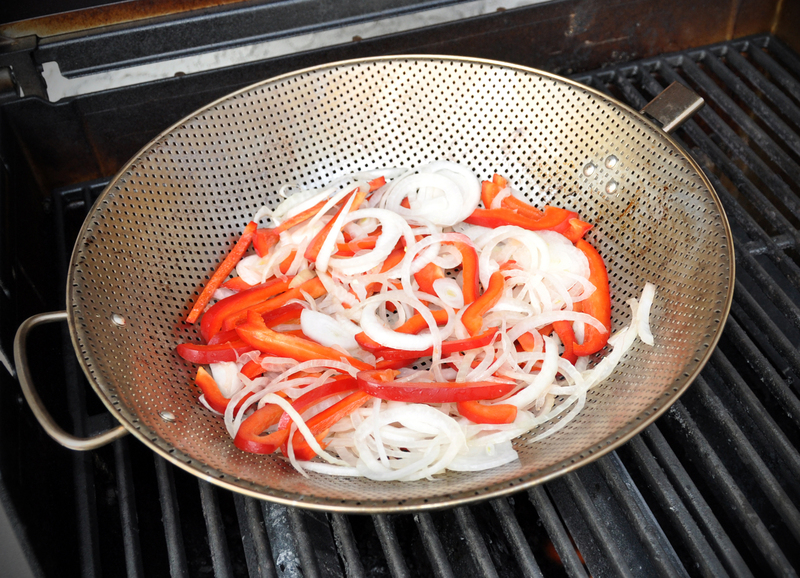 Transfer the peppers and onions to a grill pan and place on a preheated grill. Cook for approximately 10 minutes until the peppers and onions are tender. 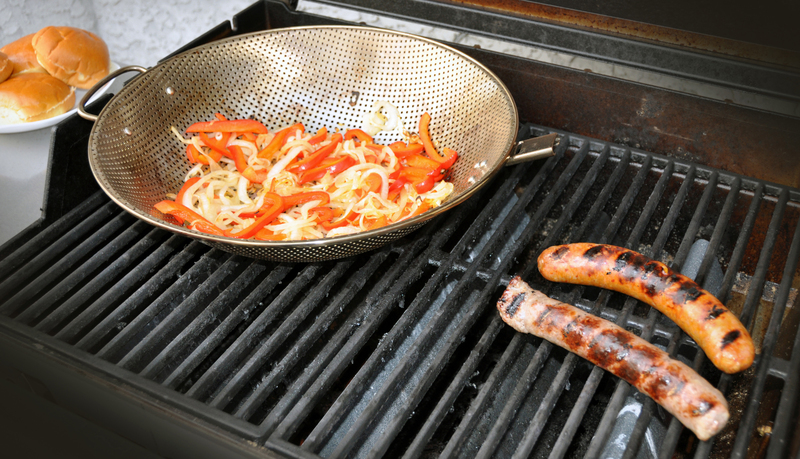 When we cook peppers and onions (or any small veggies that benefit from a good “toss” as they grill) we use a stainless steel Grill Chef’s Pan with a removable handle. While the veggies cook, place the two sausages on the grill. If you have the ability to control the heat on the sausage side of the grill, increase it to high heat (but leave the veggies at medium). Cook the sausages over high heat for approx. 6 minutes per side (or longer if you’re using medium heat). 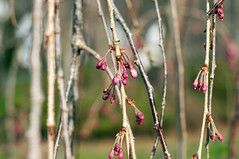 If desired, lightly toast the buns on the grill by placing them cut face down over medium heat. 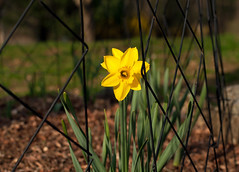 Keep an eye on them so they don’t burn! In order to fit the sausages neatly on our round sandwich buns, we sliced the cooked sausages in half and then sliced each piece lengthwise. 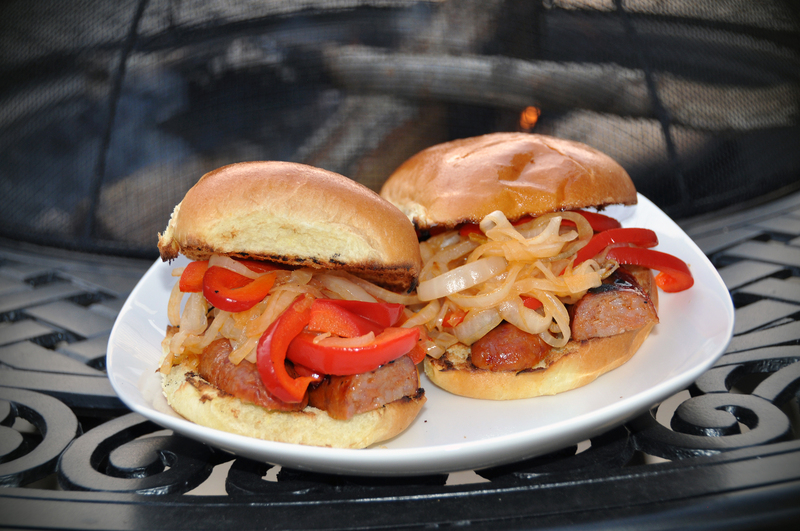 Place the sausage on the buns and top with grilled pepper and onion mixture. Enjoy your completed sandwich while lounging outside by a fire pit if at all possible… it makes it taste even better! 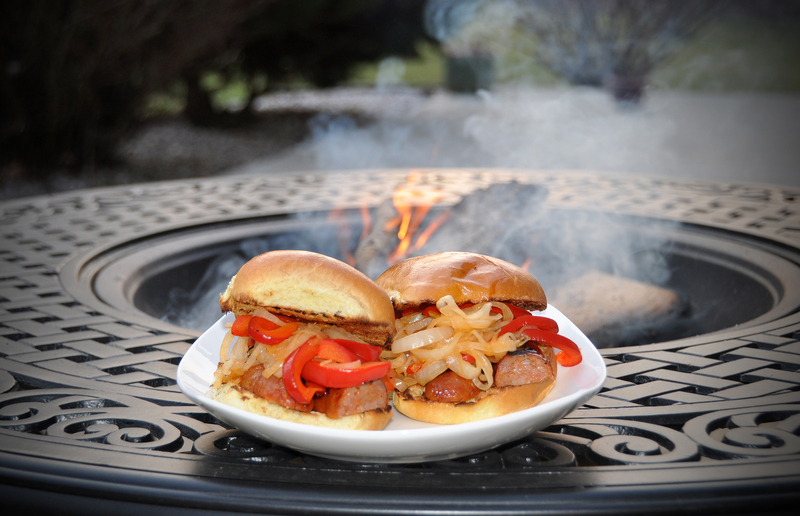 Sausages, peppers and onions…who could resist.